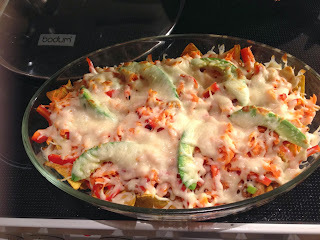 Pour the nachos into an ovenproof dish. Add bell pepper and spring onions to the pan and give a quick stir to pick up the last of the sauce. Pour over the nachos. Top with slices of avocado and the cheese. Broil until the cheese has melted - about 5 minutes in my oven, but keep an eye out. Serve with more avocado and chili sauce.